Difficulty: (YDS) class 3 (winter scramble). 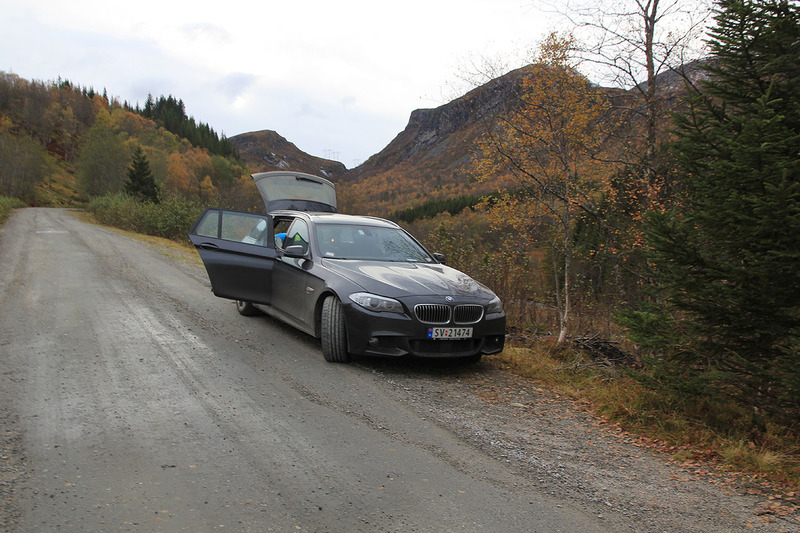 From Ålesund, drive about 38 kilometer along E-39/E-136 (Direction Molde) to the small village Sjøholt. Turn right on Hwy. 650, follow this about 7 kilometer and make a left on the smaller road 102, going to Tresfjorden (closed in winter). Drive past Kjersemvatnet lake (right side) and continue down the valley. Næremstindan is now up on your left side. 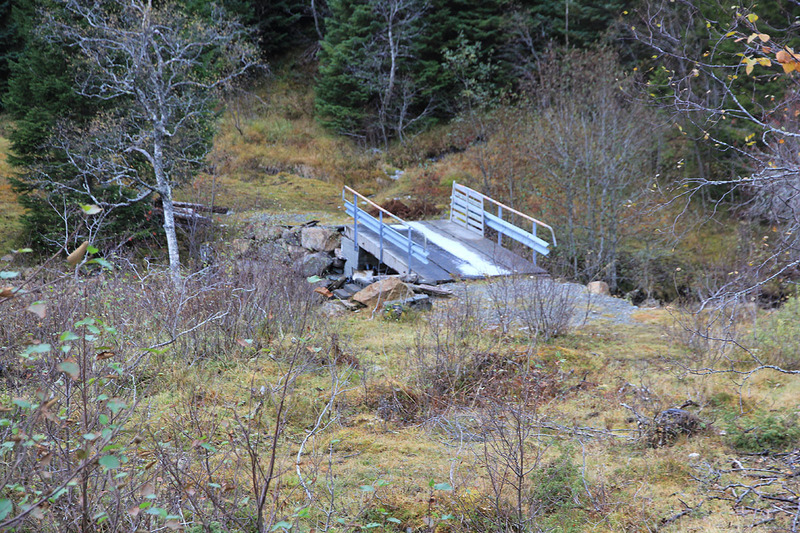 Locate a bridge that crosses the creek on your left and park along the road near this bridge. This is the trailhead, location N62.48249, E007.04684, elevation about 270 meter. As you look up on this mountain, you see Høgsvora on the left, the main creek comes down a valley starting near the connecting saddle, you should always be well on the right hand side of this creek. Cross the bridge and head uphill among trees, there are many vague paths and easy to find a way. Higher up, aim for the broad ridge that comes down having some (steeper) cliffs on the right side. One may head up right, then cut across left to gain the ridge, or go left pretty early, then ascend right. In either case, avoid the section with trees directly below this ridge. Continue uphill on the broad ridge and aim for a clear, local saddle visible towards the horizon. You may avoid most of the talus/boulders by ascending here. This saddle is at location N62.49612, E007.02207, elevation about 1070 meter. From here, scramble along the ridge (to your right). You will first arrive at a cairn, then turn left while descending before the continuation to what appears to be a highest point. This high point is at the end of a very narrow section of the ridge. From there, you will see another possible high point marked with a cairn. These two points are almost of equal height. Visit both om them. This route is likely (YDS) class 2 in summer as one may bypass a few sections of the top ridge on the left hand side. We got underway around 1045 and made the crest of the ridge by 1245. Just before getting to the local col on the main ridge, we came upon a pretty big hare. The fur was completely white and we had a good sighting as it moved only a short distance then waited for us to get closer. Next, we enjoyed a long scramble along the top of the ridge, sometimes quite narrow, to the cairn that marked the last possible high point along the route. In the beginning, we followed the tracks of a fox (obviously, he did not know about the hare). However, the fox had four legs and had cut across some questionable ledge where we decided to follow a higher and somewhat safer route. The rocks had a coating of ice with some new snow on top and care was needed to avoid unpleasant consequences. The first cairn along the ridge has been built in a rather strange location, certainly not at a high point. What appears as the highest point when viewed from there, is a rather sharp and narrow section of the ridge (type one leg on either side..), I measured this to 1170 meter on my GPS. The final cairn located further along measured 1171 meter on my GPS. We arrived at this location after one hour, at 1345. It was hard to say which point is the highest. In fact, from this location it is also hard to say that the summit across the saddle, called Høgsvora, 1163 meter, is appreciably lower. 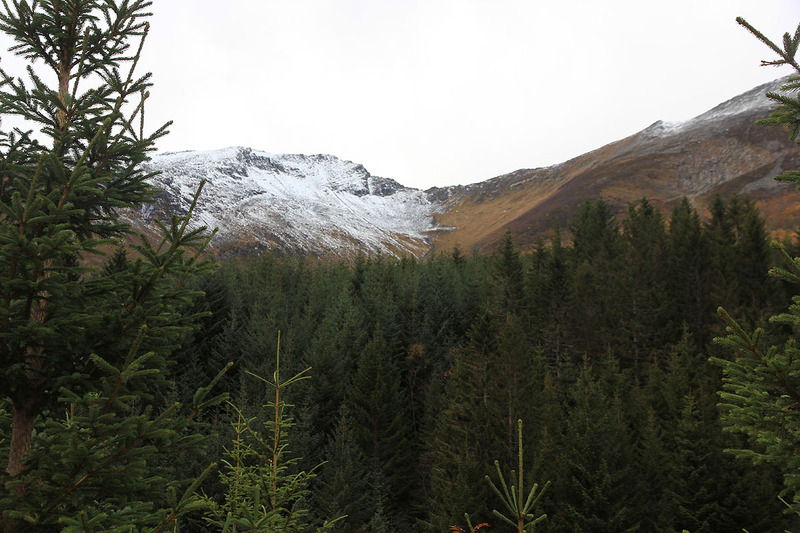 It took us another hour to return along the ridge, then descending to the car arriving there at 1615. Thanks to Børre for good company and great hositality!